Last year, PCGamer.com got an upgrade. It was shiny and new. With our new site came our new Hardware channel, and with our new hardware channel came a series of buying guides for aspiring PC builders and gamers. We've covered most of the major PC components so far, from processors and SSDs down to accessories like mice and keyboards. Now it's time for our hardware guides to get their own upgrade. We've been playing around with the design of our buying guides. Our main goal was to find a better way to present the components we recommend to readers looking for a quick recommendation, while keeping intact all the hard work, research, and context that goes into each guide. Last week we moved all of our buying guides over to a new layout intended to achieve both of those goals, while getting a bit more flashy PC Gamer Red on the page. It's a little shinier, a little newer. Here's an example. And here's a picture of an example that you don't have to click. Along with making the buying guides easier to read (no more pages! ), this new layout includes dynamically updating price modules so you don't have to guess at recent changes in Amazon's pricing algorithms. If you don't see the price module for a component here or there, don't panic—we're still working out some kinks, and you can always click on the name of the component for a link. If you're looking to game on the go, our list of the best gaming laptops has options to fit whatever budget you are working with. We compared the best processors on the market (with gaming in mind, naturally) to pick our favorite all-around CPU, a beefy high-end chip and a wallet-friendly budget model. 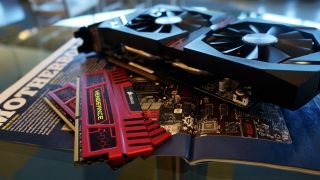 The soul of any gaming rig, we tested a ton of GPU's to find the best graphics cards you can buy for any rig. An essential part of any modern PC, the best SSDs for gaming will boot into Windows in seconds and keey your load times to a minimum. We tested an absolutely huge number of mice to make our list of the best gaming mice, providing alternatives for those with small hands or who are left-handed. We think mechanical keyboards are king for gaming, but our list of the best gaming keyboards has a membrane option for those who disagree. Fast CPUs and graphics cards are great, but the best chairs for sitting at a PC will keep your spine in working order for years. You care about your spine, right? Audiophiles rejoice, because our list of the best gaming headsets has sorted through all the top options to find which pair of cans have the best fidelity. Looking for a headset with a little bit more freedom? We put together our list of the best wireless gaming headsets when you want to game on the go. It doesn't matter how strong your PC is, the game has to look good on screen, and our list of the best monitors will make sure it does. We test the DualShock 4, Xbox controllers, and more for comfort, quality, and most importantly, compatibility with PC to find the best PC gamepad. If you're looking to add a facecam to your livestream or Youtube videos, our list of the best webcams will make you look good doing it.